All sections start at 9AM Saturday. Up to three half point byes permitted in the K-12 Varsity, K-8 Varsity, and K-1. Up to four half point byes permitted in the other sections. These byes must be requested upon entry and are not rescindable after 10AM Sat. $65 for online only between Mar. 5th and Mar. 10th. $75 on site. On site entries will get half-point bye in round 1. The NCCA does not have a room block with regards to this event. 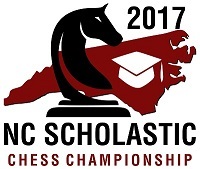 © 2017 NC Scholastic Chess Championship. Sponsored by SAS. 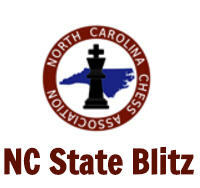 Supported by NC Chess, Chess Stream, Triangle Chess, Charlotte Chess Center, Chess Pig.